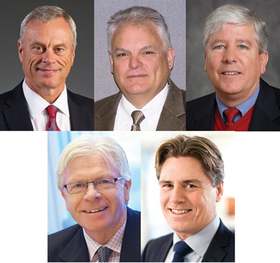 Clockwise, from top left: Dan Serbin, executive vice president of human resources at Parker Hannifin Corp.; Jeff Finch, senior vice president and general manager, products and markets, Eaton Corp.; Dan Leonard, director, global business development, Firestone Industrial Products Inc.; Patrik Romberg, senior vice president corporate communications, Trelleborg A.B. ; and Poul Jeppesen, president and CEO, SKF USA Inc.
AKRON—Even in a global economy, rubber manufacturing is ever present in the American market. In years past, the trend was outsourcing, but today, insourcing is more common for manufacturers. Rubber product makers across different facets of the industry face the same issues and agree the American market is still an important place to do business. Although manufacturers can succeed globally, executives say the best piece of advice is to think locally. “North America represents one of the largest industrial economies in the world and as such it is vital with a strong presence in this market,” said Poul Jeppesen, president and CEO of SKF USA Inc. The Lansdale, Pa.-based firm's philosophy is to manufacture close to its customers because it's a great benefit for those businesses. That allows the company to invest in extending the life of its equipment as well as increase energy efficiency and reduce the environmental impact. Dan Serbin, executive vice president of human resources at Parker Hannifin Corp., shared a similar sentiment. “Parker provides valuable components and systems for our customers, and it is important that we follow our customers wherever they need us to support their business,” he said. Each Parker facility “follows disciplined lean manufacturing principles that maximize quality, reliability and financial performance,” he said. Things are a little different at Firestone Industrial Products Co. L.L.C. Dan Leonard, director, global business development, said Firestone is an iconic American brand, so “it makes sense” to maintain a presence in the U.S.
“As a global company, we understand the importance of providing our customers with quality engineered products delivered on time,” he added. Firestone has multiple locations around the world and in the U.S., allowing the company to respond locally to customers. It just makes sense financially for a global company to have proximity to its customers. Production in the U.S. often provides more favorable conditions, Romberg said, which helps the company remain competitive as far as logistics costs and services are concerned. “We think it's important to have a manufacturing presence as close as reasonably possible to the point of consumption of our products,” said Jeff Finch, senior vice president and general manager, products and markets for Eaton Corp.'s hydraulics business. He said the U.S. will remain a large market for Eaton's fluid conveyance products, so the firm feels compelled to manufacture here. Having a presence in America can mean a range of things, but for these companies, it means production plants, along with research and development and business offices located in the U.S.
Romberg said Trelleborg has five business areas represented: Trelleborg Coated Systems; Trelleborg Industrial Solutions; Trelleborg Offshore and Construction; Trelleborg Sealing Solutions; and Trelleborg Wheel Systems, all of which have production plants along with research and development facilities and sales offices. Trelleborg has approximately 20 manufacturing facilities in the U.S.
“Trelleborg supplies amongst others high precision seals for the aerospace industry, industrial hoses, industrial tires and polymer-based solutions in offshore deep-sea environments,” Romberg said. Parker Hannifin has all seven of its operating groups represented in North America, with 170 plants across 40 states in the region, Serbin said. “More than 50 percent of our sales are here, and we could not support those sales by manufacturing in another region,” he added. Finch said Eaton manufactures hose in “probably half a dozen facilities in the U.S., and then we have other facilities around the world.” The company has administrative offices in the U.S. as well. Firestone Industrial Products has two production plants in the U.S., along with its global headquarters in Indianapolis and global technical facility in Fishers, Ind. The Bridgestone Americas Technical Center is in Akron. Jeppesen explained SKF continues to expand in the American market with acquisitions, such as its purchase of Kaydon Corp. in October that added 50 manufacturing sites across North America. “These cover all five of the SKF technology platforms: bearings, lubrication, seals, mechatronics and services,” he added. He said the sites represent all business areas for SKF: automotive, strategic industries and regional sales and service and specialty busi-ness. He said roughly 24 percent of the 2013 group's total sales of $10 billion are in North America, and that continues to grow. Finch couldn't say how much of an impact the recession has had, but Eaton is constantly looking at the best cost locations to manufacture. Manufacturing in America has gradually resurged, as the economy here has fared better than in most other regions, Serbin said. He added that America has advantages in infrastructure, supply lines and a set of laws and regulations that support free flow of commerce. Romberg said the U.S./North American market is “a key market for Trelleborg,” and about 20 percent of its net sales derived from the region. This prompted Trelleborg to close or consolidate 15 units that year, but despite lower sales, the company's market positions generally were retained or improved during 2009. “While leading positions are attained mainly through organic growth, bolt-on acquisitions are implemented to strengthen market presence and the product range,” said Romberg, explaining how Trelleborg competes in the market. He said Trelleborg recently acquired a 51-percent stake in the North American group Max Seal, which develops and manufactures polymer-based sealing systems for various types of pipes deployed in water and wastewater systems. Trelleborg also acquired Maine Industrial Tire, a U.S.-based market leader specializing in solid industrial tires. Labor costs used to be a primary factor when determining where manufacturing would be placed, but with the rise of transportation costs, other factors must be considered, Finch said. Finch said fuel and transportation costs make it more costly to move things around now than was the case 20 years ago. “And the labor rates have modified to a degree also around the world,” he said. Jeppesen agreed, explaining that being close to customers means cutting the overall cost with shorter transportation time. He said 20-30 years ago, the labor in North America was expensive, and the material was inexpensive, which is when outsourcing became the trend. “This trend seems to change now with more and more companies looking to insource again,” Jeppesen said. “Technology and automation is driving the manufacturing process more and more, and labor becomes a smaller portion of the total cost. Along with low energy cost, it is again reasonably attractive to manufacture in North America,” he said. Romberg also said that when a manufacturer is able to stamp its product “Made in the U.S.,” it is a plus for the North American market. Jeppesen said SKF has experienced a shortage of skilled labor. “Today, some statistics say we have more than one million jobs open, simply because we do not have the required skill level,” he said. To counter this, SKF focuses on promoting manufacturing to younger demographics, such as participating in the annual Manufacturing Day in October, coordinated by the National Association of Manufacturers. Trelleborg has the same vision, strategies and priorities for continuous improvement, with no time limit. Romberg said North America is an important market for Trelleborg, and investments in the region will continue, including its recent announcement that Trelleborg Sealing Solutions is relocating its lean manufacturing operations of engineered seals and bearings for advanced applications in aerospace, automotive, life sciences, and offshore oil and gas industries to the Colorado Technology Center in Louisville, Colo.
Leonard said the goal for Firestone Industrial Products “is to be the preferred development partner of our customers. The company revisits its five-year plan annually and revises it according to the needs of customers and the direction of the market. Serbin said Parker sees continued opportunity in the market to “drive innovation, which is the engine of our growth strategy and an important part of our legacy. He said these cutting edge technologies are leading to new job creation in America. SKF will continue to focus on growth opportunities in the North American market and globally for that matter, Jeppesen said. THEN AND NOW: Mike Meyer, BRC Rubber &amp; Plastics Inc.
&#160;THEN AND NOW: Kevin Carver, Sil-Pro L.L.C.